Notes: Originally built to replace the Lutheran Academy building after it burned in 1917. It opened in 1919 with 8 grades and 4 years of high school. An addition was added in 1941 along with rural bus service. Other additions were made to the property in 1948 and 1949. In 1949 a unified school district was formed to include the village and the surrounding rural areas. By 1961 the new Mt. 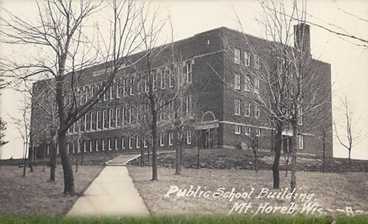 Horeb High School was opened in its present location.